Heith Baughman, from left, and his mother Marlene Baughman walk through their family’s almond orchard just northwest of Bakersfield. Heith Baughman is president of HB Ag Inc., which does farming and custom harvesting. profit community unique and six fun ways you can be a part of Give Big Kern. Hope and promise is also at the center of Beatris Espericueta Sanders’ contribution on the history and mission of Adventist Health Bakersfield’s AIS Cancer center, which combines state-of-the-art medical technology and care for the spirit to offer local cancer patients world-class treatment right here at home. Also in this issue is Kelly Bearden’s piece on United Pipe and Steel Fabrication, a growing local business that nearly fell victim to the oil downturn in 2014, before finding success in diversifying its customer base, and is now thriving. Contributing writer Dianne Hardisty takes a fascinating look at the twists and turns in the unlikely legal battle between the dairy industry and almond growers over the use of the word “milk” on the labels of plant-based beverages. The local stakes are high, as both industries are big business in Kern County. Things are looking up for United Pipe and Steel Fabrication, which diversified its customer base in order to survive the oil downturn. player Heith Baughman has used his cando attitude, refusal to accept failure and strong support system to open and develop a successful ag business. 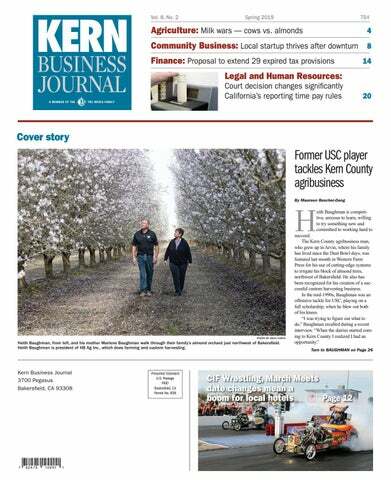 Spring has sprung in the pages of Kern Business Journal. If you’ve ever dreamed of potentially reaching thousands of customers with your American products, now is the time to act. Walmart is accepting applications for its sixth annual open call, scheduled for June 18 and 19 at the company’s campus in Bentonville, Ark. Apply today by visiting Walmart-jump.com for the opportunity to secure a face-to-face pitch meeting with a Walmart buyer. The application deadline is April 30. This year’s open call attendees could secure deals ranging from a handful of stores in local markets, to supplying hundreds, even thousands of stores, Sam’s Clubs and Walmart. com. The two-day event informs, empowers and encourages attendees, while providing effective networking opportunities for local entrepreneurs. “Our customers tell us that products made, sourced or grown in the U.S. are important to them and we work year-round to identify local suppliers and source products that our customers are proud to buy,” said Cindi Marsiglio, Walmart’s vice president of Merchandise Services and U.S. Manufacturing. Bakersfield College’s Fire Technology Program earned a five-year reaccreditation niche and innovative products that fill a need for our customers and support jobs right here in America.” During the 2018 Walmart open call, nearly 600 meetings were held with product pitches including toys, apparel, natural health and beauty aids, and food. Prospective suppliers traveled from 46 states, the District of Columbia and Puerto Rico. More than half of the attending businesses self-identified as diverse, including nearly 25 percent identifying as womenowned. relationships with fire agencies in Bakersfield and Kern County, routinely attracting students statewide to its centrally located campus through its varied curriculum and specialty course offerings. The college has an energetic approach to program enhancement with a strong focus on diversifying student populations while maintaining an unwavering adherence to standardization.” BC’s Fire program was first developed in partnership with Bakersfield Fire Department Chief, Phil Pifer in 1956 and has since expanded tremendously. Today, BC offers five different fire degrees or certificates within the program and ten within the entire Public Safety pathway. California is the largest milk-producing state in the nation. Kern County’s approximately 50 dairies produce about 10 percent of the state’s output. In December, federal appeals court justices sided with Blue Diamond Growers that the labeling of their almond milk was not misleading or confusing consumers. gross state product in 2014 and about 189,000 jobs in California were dependent on the state’s milk production and processing.” Dr. S. Aaron Hegde, chairman of the Economics Department at Cal State Bakersfield, notes that Kern County’s approximately 50 dairies produce about 10 percent of the state’s output. While there has been little change in output, Hegde said dairy prices have declined because of decreased global demand, particularly in China. He attributed the decline to the ongoing trade war with China, as well as some U.S. consumer preferences shifting to “alternatives” to dairy milk. Almond production in Kern County has been trending upwards, Hegde reported. But similar economic trade constraints also have impacted almond exports to China, which has been an increasing importer of almonds over the last few years. To make up the loss, the almond industry has turned to new markets, including the production of almond milk, said Hegde. In January, Blue Diamond announced plans to expand its processing plant in Turlock to accommodate increased production of almond milk. The expansion, which is scheduled for completion in 2020, will make a butterlike base for the Almond Breeze brand. The base will be shipped to locations around the world, where water is added to create almond milk. If consumers consider dairy and nut milk to be “indifferent” products, or substitutes in economic terms, then the decrease in demand for cow milk would be represented by an increase in almond milk or soy milk consumption, Hegde said. However, limiting the use of the term “milk” on the labels of plant-based products may lead to fewer new consumers making the switch to soy milk or almond milk. Despite recent court rulings that support a “qualified” use of the term “milk” on the labels of plant-based beverages, the FDA is moving forward with its proposed rule to require such products as almond milk and soy milk to be called fake, imitation or alternative beverages. No date has been announced for the new rule to be adopted. But after kicking over a beehive of controversy, FDA Commissioner Gottlieb announced in March that he would be quitting in April to spend more time with his family. After only about two years in the office, Gottlieb has managed to unite liberal-leaning opponents of meat-product consumption, including dairy products, and political conservatives, who decry regulations and view the milk labeling squabble as a government overreach. In a recent nationwide opinion article, the former Republican Attorney General of Virginia, Ken Cuccinelli, called the FDA’s effort to ban the word “milk” on the labels of plant-based beverages a marketing sham. “Instead of improving their product or marketing, the dairy industry has sought out the government’s help to quash their new competition, and the FDA seems willing to comply,” Cuccinelli wrote. “However, despite all the bluster suggesting deception, less than 10 percent of people actually believe these non-dairy alternatives actually contain cow’s milk. “There is no widespread deception. The dairy industry just wants protection. It’s a shame the FDA is participating in this assault on freedom of choice and marketing competition,” Cuccinelli wrote, adding that the maneuver “looks an awful lot like the swamp that President Trump so frequently, and rightly, rails against.” With Gottlieb’s departure, the fate of the proposed rule banning the word “milk” from almond milk labels is uncertain. Farm equipment lined up on a sunny afternoon on South Union Avenue. ment is highly leveraged, the looming change for depreciation addbacks after 2021 will worsen this result. The ripple effects of disallowed interest may affect mandatory tax distributions for partnerships and loan coverage ratios negotiated under prior law. Farmers must now evaluate the present value of bonus depreciation deductions and the potential benefits of the QBI deduction against any potential disallowed interest deduction. Conversely, they must calculate the value of deducting all interest paid against using slower depreciation lives and no bonus depreciation for longer lived assets. Now more than ever, the agriculture industry must rely on comprehensive financial modeling to accurately assess these tax trade-offs. Strategies to mitigate or resolve these issues exist and require experienced analysis. Your tax advisor can help to assess the unique effect of these tax law changes on your farming business so that you can make the most effective purchasing decisions. Ann Braun is a Managing Director in the Bakersfield office of CBIZ and MHM, one of the nation’s top ten accounting providers. She is experienced with tax consulting and tax return preparation, as well as succession planning and estate planning in the agriculture industry. She can be reached at abraun@cbiz.com Steve Powers is a Manager in the Bakersfield office. He specializes in tax planning and consulting for the agriculture industry. He can be reached at steven.powers@cbiz.com. United Pipe & Steel Fabrication in Bakersfield offers a wide range of certified services including automated orbital welding and water jet cutting. Installation of industrial piping is one of United Pipe & Steel Fabrication’s specialties. centers within the University of California, Central California SBDC Regional Network, which is a partnership between the university and the U.S. Small Business Administration. The center at CSUB assists small business owners in Kern, Inyo and Mono counties by providing free consulting, small business training and research. For more information, go to csub.edu/sbdc Kelly Bearden is the director of the Small Business Development Center at California State University Bakersfield. while the hot grates create the strip marks that are typical on charbroiled foods. While customers frequent those businesses with the expressed purpose of enjoying that charred flavor, new equipment is necessary to capture the significant emissions that accompany it so the Valley can continue working toward PM2.5 attainment. While there are ongoing improvements in the technologies available to reduce commercial cooking emissions, the costs of installing controls for commercial underfired charbroilers remain high. The District’s new incentive-based measure aims to help fund the installation of those controls. Interested business owners are encouraged to contact the District right away to take advantage of available incentive funding. For more information about the incentive program, please visit www.valleyair. org/grants/rctp.htm or contact the District’s Technology Advancement Program staff at (559) 230-5800 or technology@ valleyair.org. Nzong Xiong is an Outreach and Communications Representative with the San Joaquin Valley Air Pollution Control District. You can recycle your old mattress for free. Stop illegal dumping. Don’t dump your old mattress. Not only is it illegal, but it will end up in a landfill when it could be so much more. On the other hand, recycling the mattress and box spring lets the steel, foam, fiber and wood become new products. Like steel parts, filters, carpet padding and even mulch for your garden. Find out about your FREE recycling options at ByeByeMattress.com. harlie Mulligan is a busy guy. In early 2018, just seven years after cofounding the online nonprofit giving platform GiveGab, this CEO went on to acquire fellow fundraising leader Kimbia, which had been around longer than GiveGab. With this addition, Mulligan continued to grow GiveGab, based in Ithaca, New York, into the largest nonprofit giving platform in the world, having processed more than $1.5 billion in donations for more than 35,000 nonprofit organizations across the country. These days, Mulligan flies frequently across the U.S. to meet customers from GiveGab’s now close to 200 Giving Days that have a presence in all 50 states. An avid mountain biker, Mulligan takes his trustworthy Trek Stache bike with him wherever he goes — including Kern, which he visited in rain-soaked early March. Despite the rains, he still was able to do some great riding that afforded him views of our surrounding mountains. But his real reason for stretching his legs this far was to meet with Kern Community Foundation, which has been hosting Give Big Kern, our county’s official online Louis Medina Day of Giving, since 2016 — and with GiveGab’s help since 2017. Mulligan received a warm Kern welcome, including dinner at Wool Growers Restaurant and the opportunity to speak at a training event to representatives from about 50 of the more than 130 nonprofits that have signed up to participate in Give Big Kern 2019. Mulligan and his colleagues get invited to speak to many Giving Day groups, he said, but having the Mayor present (our very own Honorable—and ubiquitous—Karen Goh of Bakersfield), and Bakersfield City Ballet performing a motivational number to go with this year’s Give Big Kern theme, “Dream B-i-ii-g!” was definitely a first for him. We asked the Cornell MBA graduate to share some thoughts about Give Big Kern, Giving Days in general, and GiveGab’s corporate culture. Q: What do you think about Give Big Kern? What makes it different from GiveGab Giving Days in other communities? A: I was really excited to see how enthusiastic your participating nonprofits are about Give Big Kern specifically, and also about improving their online fundraising in general. I think what is unique about Bakersfield and Kern is the fact that much of the nonprofit community is relatively new because the city and county have grown so fast over the past few decades. This makes for unique challenges and opportunities and it is really exciting to think about how much more we can all accomplish together. GiveGab co-founder and CEO Charlie Mulligan addresses a group of local nonprofit leaders. Q: Putting on Giving Days across the country and throughout the year is a lot of work. What motivates you and your team? What is the most enjoyable part about putting on Giving Days? A: We constantly listen to and adjust to our customers and users. Every single Giving Day we do helps us learn a little more and get better, and we’re making slight iterations and improvements throughout the year. A: Giving Days are extremely rewarding and exhilarating. It is incredibly satisfying to help local nonprofits do great things — especially when so many nonprofits we work with are just beginning to tap into the power of online fundraising. Q: What’s coming for Giving Days in the U.S.? What are some trends you see emerging? Q: GiveGab’s mission is “More Happy Nonprofits.” Your company refers to customer service as “Customer Love.” Why are you such a stickler for superior customer service? A: Nothing matters if your customers don’t love you. We believe the entire reason we exist is to help our Giving Day partners, participating nonprofits, and donors be happier and more effective. Customer Love is everything. It determines every single action we take — because at the end of the day, it is the only result that really shows we are accomplishing our mission: More Happy Nonprofits. Q: Can you talk a little bit about how GiveGab implements customer feedback into product development/product enhancements for your Giving Day platform? A: People across the country are yearning to be more meaningful donors for nonprofits that are local to them. Giving Days have an enormous capacity to help donors and nonprofits start and build relationships, and I feel like we’re just beginning to tap into the amazing potential of technology to help facilitate these relationships. Give Big Kern, “One Day to Celebrate the Giving Spirit of Kern County,” happens on the first Tuesday in May, which this year falls on May 7. The website givebigkern.org went live on April 7 and will remain open through May 8. We encourage the entire community to engage with our hard-working nonprofits by giving or volunteering through Give Big Kern. Questions? Visit givebigkern.org > Menu > FAQ or write to Louis@kernfoundation.org. Louis Medina is the Director of Community Impact for Kern Community Foundation. Give Big Kern is Tuesday, May 7 Here are some ways to have fun while giving back to Kern’s hard-working nonprofits on Give Big Kern Day. nonprofits as they receive a proclamation declaring May 7, 2019, Kern County’s Official Day of Giving. All day long: Donate money or pledge volunteer hours to hard-working nonprofits on givebigkern.org. Search for an agency/agencies to support, find your passion, and Give Big. Listen for special matching and challenge gift announcements on local broadcast media, and monitor Give Big Kern’s social media pages (Facebook, Twitter, Instagram @GIVEBIGKERN) to multiply the amount of your donation. 10 a.m. to 4 p.m. at the Idea Hive, a co-share space at 1910 19th Street in Downtown Bakersfield: Come and meet a dozen nonprofits making a difference in education, social services, the arts and the environment, that will be using the Idea Hive to host an open house for the public. Learn about these agencies’ work, ask questions, and donate or pledge volunteer hours to them through Give Big Kern. 6 a.m. at Bakersfield’s Liberty Bell, corner of Chester and Truxtun Avenues Downtown: Join scores of nonprofits as they “Ring in Give Big Kern Day.” Bakersfield Mayor Karen Goh will deliver a Give Big Kern Day proclamation from the city. 5:30 to 7:30 p.m. at Temblor Brewing Company, 3200 Buck Owens Blvd, in Bakersfield: Celebrate the fundraising accomplishments of Give Big Kern nonprofits at the Give Big Kern After Party. COLD OR DRY STORAGE PRICE REDUCED $850,000 1.83± acres, 37,090± square feet storage, Earlimart. SHOP, LAND & POLE BARNS SALE PENDING 19.55± acres, Grade1 soils, within Semi-Tropic WSD boundries and adjoining water bank. Wasco area. LAND $1,500±/AC 76.36± acres, Lokern Rd, boundaries Belridge WSD, west of Buttonwillow. ALMONDS & PERSIMMONS SOLD 80± acres, young plantings, Kings Co WD, 2 wells, good sandy loam soils, Hanford PISTACHIOS SALE PENDING 99.66± acres, planted 2006, Semi-Tropic WSD boundary, 2 wells, grade 1 & 3 soils, Shafter. LAND OPPORTUNITY $16,635±/AC 150.29± acres, close to PGE sub-station, natural gas main line, high transmission power lines traverse the site. Buttonwillow, Ca FARMLAND SALE PENDING 155.85± acres, Lemoore canel Co. district and well water, mostly grade 1 soils and adjoining City of Lemoore. Check out givebigkern.org/ info/events to learn about promotions from Cornerstone Bakery, Papa Murphy’s Pizza, Camelot Park, and other local businesses that will donate a portion of proceeds from your purchases to Give Big Kern. The Good Vibrations Motorsports March Meet helps fill Bakersfield hotel rooms every year. More than 16,000 people passed through the doors of Rabobank Arena for the CIF Boys’ and Girls’ Wrestling Championships in February. CIF Wrestling expanded to include both boys’ and girls’ championships at Rabobank Arena in 2019.
over the previous year. For March Meet, data from STR, Inc., showed hotel rooms sales increased about 17 percent compared with the same nonMarch Meet weekend the year before. The average daily rate charged by hotels was up about 20 percent and hotel revenue was up about 41 percent. But what about the first weekend of March that fell between CIF Wrestling and March Meet? As expected, Bakersfield-area hotels saw significant declines across the board for that non-event weekend, compared with the same CIF and March Meet-filled weekend in 2018. According to STR, Inc., hotel room sales declined about 29% and the average daily rate charged by hotels was down about 26%. Revenue also was down about 47%. As these figures show, separating CIF Wrestling and March Meet gave Bakersfield hotels two big weekends, rather than trying to accommodate both events on overlapping dates. More hotel revenue means more hotel tax revenue flowing to local governments. These calendar changes also will allow CIF Wrestling and March Meet to continue to grow. As they grow, Bakersfield hotels will be able to keep up with the demand. As of April 2019, three hotels were under construction in the City of Bakersfield and plans for an additional three hotels have been submitted to City Planning. When all six of those hotels are completed, an additional 658 rooms will be added to Bakersfield’s hotel inventory. 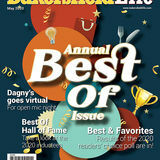 David Lyman, PhD is manager of Visit Bakersfield. He and other members of Team More to Explore help visitors from throughout the world spend their money in California’s ninth largest city. They are available toll-free (866) 425-7353 or at Info@VisitBakersfield.com. success and competency. • Self-directed learning — Whether keeping up with trade journals, reading business books or even researching specific questions, all entrepreneurs report some kind of self-directed acquisition of knowledge. • Educational platforms — This refers to enrolling in management, business education or professional development. • Peer support — This refers to reaching out to others in a similar line of business to network and learn how to handle any issues that arise. This kind of activity ranges from informally keeping up with your classmates from your undergrad program or business school, to creating a board of advisors, to joining a trade association or a mastermind group. 100 percent of driven entrepreneurs and 95 percent of other entrepreneurs report peer support activity. Involvement in a formal group that is designed to help its members excel can be far more effective than informal peer support. Mastermind and CEO groups provide the best places for entrepreneurs to truly accelerate their success. They have an executive director to run the group, as well as membership fees, which range anywhere from $100 to over $100,000 per year. This buy-in helps to guarantee the commitment of members to each other and their common purpose. All of these approaches to improve your business and your own leadership skills can help your business and your employees improve outcomes. Reported results include an increase in employees’ self-awareness and motivation, development of employees’ self-confidence and improvement in their overall well-being. *Survey of 759 North American entrepreneurs who are senior management (all C-level executives) who have at least 25% stake in their privately held businesses. The revenues at the companies had to be at least $5 million annually in each of the past three years. Timothy J. McNeely is an Investment Advisor Representative with Dynamic Wealth Advisors dba Lifestone Family Office. For more on how you can adopt the habits of a driven entrepreneur and make your business even better, contact Tim McNeely of LifeStone Family Office by visiting LifeStoneCO.com, by phone at (661) 368-0947 or on twitter at @ timmcneely. include: • Credit for nonbusiness energy property (IRC §25C). • Credit for new qualified fuel cell motor vehicles [IRC §30B(b)]. • Credit for alternative fuel vehicle refueling property (IRC §30C). • Credit for two-wheeled plug-in electric vehicles (IRC §30D). • Second generation biofuel producer credit [IRC §40(b)(6)]. • Biodiesel and renewable diesel incentives [IRC §§ 40A, 6426©, and 6427(e)]. • Credits with respect to facilities producing energy from certain renewable resources [IRC §§45 and 48(a)(5)]. • Production credit for Indian coal facilities [IRC §45(e)(10)]. • Railroad track maintenance credit (IRC §45G). • Credit for energy-efficient new homes (IRC §45L). • Three-year depreciation for race horses two years old or younger [IRC §168(e) (3)(A)(i)]. • Special allowance for second generation biofuel plant property [IRC §168(I)]. • Energy-efficient commercial buildings deduction (IRC §179D). • Election to expense mine safety equipment (IRC §179E). • Special rule for sales or dispositions to implement FERC or State electric restructuring policy for qualified electric utilities [IRC §451(k)]. • Excise tax credits relating to alternative fuels [IRC §§ 6426(d), 6426(e), and 6427(e)]. • Seven-year recovery period for motorsports entertainment complexes [IRC §§ 168(i)(15) and 168(e)(3)(C)(ii)]. • Accelerated depreciation for business property on an Indian reservation [IRC §168(j)]. • Special expensing rules for certain film, television, and live theatrical productions (IRC §181). • Indian employment tax credit [IRC §45A(f)]. • Mine rescue team training credit (IRC §45N). • Exclusion from gross income of discharge of qualified principal residence indebtedness [IRC §108(a)(1)(E)]. • Mortgage insurance premiums treated as qualified residence interest [IRC §163(h)(3)]. • Above-the-line deduction for qualified tuition and related expenses (IRC §222). • Empowerment zone tax incentives [IRC §§ 1391(d)(1)(A)(i), 1391(h)(2), 1394, 1396, 1397A, and 1397B]. • American Samoa economic development credit (IRC §119). • Temporary reduction in medical expense deduction floor [IRC §213(f)]. • Extension of oil spill liability trust fund rate [IRC §4611(f)(2)]. • Black lung liability trust fund excise tax [IRC §4121(e)(2)(A)]. Please consult your tax advisor to determine how these tax extenders impact your specific situation. Joel A. Bock, CPA, MST is a partner in Daniells Phillips Vaughan & Bock, a Bakersfield accounting firm. Great lawyers close to home. A top California legal team is right in your own backyard. Whether you are operating a business or need personal legal counseling, you can rely on local attorneys who have an unrivaled track record, depth of knowledge and experience unique to the San Joaquin Valley. From business litigation, transactions and counseling, to bankruptcy, intellectual property, estate planning and employment law issues, KDG works with you to meet your legal needs and achieve successful, cost-effective results. shows business property devastated by rising waters with not only loss of buildings, equipment and inventory, but also loss of income for the duration of the flooding and beyond. All-too-frequent news stories describe diversion of cash (or other property) from a business to an employee — always a “trusted” employee. Then follow all the seemingly routine rounds of business fires, truck and auto accidents, construction injuries, burglaries and robberies, cyber-crime plus lawsuits — valid or frivolous. Do you sense that your business is vulnerable to most, if not all, of these incidents and events? ited to: • Safety • Security • Fire prevention • Cyber-security • Driver training Risk finance is complex and includes: • Risk assumption in which you opt to bear a particular risk (or portion of a risk through deductibles). • Risk transfer by contract through hold harmless and indemnification provisions in contracts. • Commercial insurance through your broker. This brief overview is merely the tip of the iceberg, as each element requires indepth thought and planning, not to mention key decisions for the future of your business. The overall goal is to lower your total cost of risk (TCOR), a calculation that includes more than mere insurance premiums. It is worth tracking and charting over several years. It includes these costs: • Deductibles and self-insured retentions • Safety • Security • Fire and cyber-crime prevention • Legal defense costs for liability risks not covered by insurance • Legal fees for drafting risk transfer clauses in contracts • Commercial insurance premiums Each of these complex elements of risk management can be more readily understood and implemented if you have, as a reference, my book entitled Quality Risk Management Fieldbook. It couples both risk management and quality management (Lean Six Sigma) disciplines and best practices — hence, the word “quality” in its title. Its 281 pages are full of data in great specificity, plus lots of worksheets, checklists, process maps and other graphics to help you walk through risk management processes effectively, well beyond your purchase of insurance. It’s endorsed by two California small business organizations as well as California and national insurance broker organizations. It’s available through amazon.com, Russo’s, and the publisher: International Risk Management Institute in Dallas (www.irmi.com) Print copies are available from each of these sources; however, IRMI also offers a digital copy for a very low monthly fee for the time you need this reference to work toward the two major goals of risk management: A lower total cost of risk and a quiet night’s sleep. With sound risk management, you can enjoy both! John Pryor, CPCU, ARM, AAI, AIS is a risk management consultant for CSU Bakersfield’s Small Business Development Center. For counsel without fee through the SBDC, go to www.csub.edu/sbdc and click on “Get Started” to register. an employee physically reports to work but is furnished less than half of his or her scheduled hours, providing the employee with at least two hours of pay was justified to compensate them for the inconvenience and expense of essentially showing up for nothing. According to the Court, however, modern technology had advanced to the point where “reporting” could mean far more than just physical presence at the work site. Court’s Reasoning The Court ultimately reasoned that even having to place a telephone call as part of a mandatory on-call schedule fell within the scope of this “reporting” rule for two main reasons. First, requiring reporting time pay would “require employers to internalize some of the costs of overscheduling, thus encouraging employers to accurately project their labor needs and to schedule accordingly.” Second, it would also “compensate employees for the inconvenience and expense associated with making themselves available to work on-call shifts, including forgoing other employment, hiring caregivers for children or elders, and traveling to a work site.” In relying on these public policy considerations, the court aligned itself with prior California cases that linked the compensability of work time to the degree of employer control over an employee’s activities. Specifically, the Court cited the 2016 California Supreme Court decision in Augustus v. ABM Securities, which prohibited employers from having their employees carry radios and remain on-call during rest periods. The decision was made on the basis that “compelling employees to remain at the ready, tethered by time and policy to particular locations or communication devices” was inconsistent with the concept of having truly “relieved employees of all work duties and employer control.” Like in Tilly’s, the Court in Augustus was clear that this rule applied even if the employees were never actually called upon. What Should Employers Do Now? In light of this decision, employers should review their scheduling policies and be sure to avoid the dangers inherent in Tilly’s scheduling policy. Specifically, the court identified several issues with Tilly’s policy that were problematic: • Requiring the employees to call the employer; • Independently disciplining employees for late or missed call-ins; • Making call-in and reporting mandatory. Though certainly not foolproof, there are steps an employer can take to lessen the chances that your scheduling policy will fail the smell test as with Tilly’s. For instance: Have the employer call the employee, not require them to call you. This is typically accomplished by having a manager call employees from a list of potential on-call employees. This practice has been approved by various courts in related “on-call” contexts. Don’t discipline employees for failing to respond to your call to check for availability. Without fear of discipline, it would be much more difficult for the employee to argue that the policy constrained the employee’s freedom and activity. Don’t make reporting when called mandatory. If an employee answers and doesn’t wish or can’t report to work, simply move on to the next person on the list. This practice has also been approved by various courts in related “oncall” contexts. Even with these guidelines, however, no policy is a sure thing, and even minor changes could affect the way a court may interpret it. We will monitor this decision to see if a subsequent appeal is filed and whether the California Supreme Court ultimately decides to address this case in the near future. It is important to note that every employment law situation is unique and this update is not a replacement for legal counsel. If you have further questions or would like additional information, contact Jerry Pearson at jpearson@ youngwooldridge.com. Jerry Pearson is a Managing Partner at Young Wooldridge, LLP and leads the firm’s Business Department. Pearson represents management in labor and employment issues and ensures his clients stay in compliance with the State and Federal labor laws. Train them Don’t assume they know how to complete “common sense” tasks. Arriving on time, dressing appropriately and other typical work behaviors have not necessarily been taught to this generation. Processes should be documented, explained in depth and demonstrated. Bottom line: clearly communicate your expectations. Train their supervisors Supervisors are one of the key factors in whether employees stay with or leave organizations, so they need to know how to supervise in a way that inspires people to perform instead of inspiring them to complain or quit. This is applicable for supervising all generations, not just Gen Z. Give them a stake in the process Instead of simply answering emails and the phone, help them feel like they are part of the company, that they are valued and that the way they perform their job is important. Show them what they do matters in the bigger scheme of things and they’ll take a greater interest in their work. Mentor them Remember that you didn’t know everything you know now when you started working. This is your opportunity to share the knowledge you’ve gained and mentor someone like someone undoubtedly mentored you. Help them to grow, set their own goals, and achieve them. This is also a great way to ensure that knowledge gets transferred and doesn’t get lost when older people leave the organization. Yes, Gen Z is different than previous generations because of the society they are being raised in and because of who is raising them. However, all young employees need to be taught how to do their jobs, and all employees want the same things – to be heard, valued and respected, regardless of their age. If that’s not common sense, it should be. Robin Paggi is a training and development specialist with Worklogic HR. iring a worker, particularly a violent one, is one of the most stressful and often dangerous things an employer must do. A workplace shooting in a Chicago suburb in mid-February showed just how quickly such a situation can go fatally bad. Gary Montez Martin, a 15-year employee of the Henry Pratt Co., a valve manufacturer, had been the subject of months of “progressive discipline.” Company officials explain Martin repeatedly broke basic workplace rules. On Feb. 15, MarKaren Bonanno tin was summoned to a meeting at his job site, where company officials, including the plant manager, human resources manager and a college intern, who was on his first day on the job, were present to fire him. Family members and neighbors later told reporters that Martin expected to lose his job and he was very depressed. involved a firearm. Clearly, no workplace is immune to such violence. And no plans or safety procedures can assure complete workplace safety. But steps can be taken to help defuse potentially violent situations. Red flags: Before you reach the point of terminating a worker, look for warning signs or chronic problems, conflicts with coworkers, mood swings, anger, paranoia, sudden deterioration of work performance or grooming or stressful personal problems, such as divorce or financial setbacks. Intervention by employee assistance resources may help resolve some of these problems. Slow up: If employee assistance intervention does not help and appropriate disciplinary steps have been exhausted, the decision may be made to fire an employee. Take the time to do the firing right. Understand the employee. Engage other managers in identifying the employee’s problems and likely reactions to a firing. Possibly hire an outside consultant to assess risks and develop plans. Location: A neutral location should be selected for the termination meeting. Post security nearby, especially if the worker has a history of violence. Place a desk between the worker and managers handling the firing. Do not allow the worker to block the exit. Do not take a break, even if the worker asks to leave to use the restroom. A distraught worker may return with a weapon. Timing: Generally, dismissing an employee in the earlier part of the week is better than at the end. If possible, conduct the meeting towards the end of the day, so the worker can be spared the embarrassment of being walked out in front of coworkers. Meeting content: Explain in a clear, brief way that the worker is being terminated. Present the worker’s final check during the meeting. This should include any accrued and unpaid vacation or PTO, as well as any applicable separation paperwork. Explain resources available to the exiting employee. Prevent the employee from immediately returning to the workplace. Deliver personal items to the fired employee, or arrange to have the escorted former worker return when other employees are gone. Practice: Develop a plan that includes time, location and other details. Anticipate the worker’s reactions and develop potential responses. Practice the plan. The more prepared managers are for the termination, the more control they will have over a potentially volatile situation. Karen Bonanno is president of the Bakersfield-based human resources consulting firm P.A.S. Associates and P.A.S. Investigations. She can be contacted through her website www.PASassociates.com and through the P.A.S. Facebook page. ooking for some great public relations ideas for 2019? I’ve always found it useful to rummage around online for brand promotions both inside and outside the U.S. Sometimes all it takes is reaching outside the proverbial box to cook up something with a little extra pizzazz. Lovin’ it down under McDonald’s Australia recently decided to celebrate the country’s national Australia Day holiday with several phonetic outdoor posters. Affectionately referred to as Macca, McDonald’s created a campaign of their menu using Aussie slang. The clever Strayan spin on McDonald’s classic menu items included Kworda Pownda, Filadafsh, and a Bakeneg Mugmufn. Domino’s Paving for Pizza campaign at work. Bud Light’s Victory Fridges gave Browns fans something cheer about. McDonald’s humorous take on Staryan slang. ties to capitalize on trending topics, as well as current events. Obviously, this requires exercising good judgement and caution. Bud Light’s publicity stunt is an example of hitting just the right notes. Break away from the pack. Be willing to look for and take a fresh approach. A unique angle has the ability to cut through the clutter and make your company stand head and shoulders above the rest. well-crafted plan to increase productivity? The Lewis’ own one of the only craft brewing equipment manufacturing companies in California. When interest in their craft grew nationally, they tapped into Tri Counties Bank Business Loan Specialist Aaron Beckman. Aaron and team drafted a thorough review of their finances and gave them a well-crafted way to purchase new machinery and a business line of credit to keep cash flowing — raising spirits and productivity. Now that’s a refreshing solution! For personalized problem solving, switch to Tri Counties Bank. s the spring season brings our community’s annual cancer fundraising events – where generous Kern County residents rally in force to help – the team at Adventist Health’s AIS Cancer Center remembers when they first rallied for a new cancer facility nearly seven years ago. When the AIS Cancer Center was completed in December 2012, the vision focused on creating a patient-centered, world-class, comprehensive cancer center that would keep people in our community for treatment. At the time, one in five cancer patients in Kern County would leave the area for care. In sports terms, we wanted to give Kern County cancer patients – and their families – the “home field advantage.” “We know that people heal better and quicker when surrounded by a strong support system,” said Beatris Espericueta Sanders Jenny Lavers, AIS Cancer Center operations director. “Cancer is a diagnosis that affects not only the patient receiving that news, but their loved ones, family, friends – anyone connected who wants to help, so being nearby when going through treatment, that makes a huge difference.” Nearly seven years later, the four-story, 60,000-squarefoot facility features a team of three medical oncologists, one radiation oncologist and two board-certified, fellowship-trained breast surgeons (part of an all-female breast surgery team with a diagnostic radiologist and family nurse practioner, FNP). Medi-yoga is one of the many support elements and programs offered at the AIS Cancer Center. “I bought an almond ranch and literally knew nothing about almonds. I had a consultant, who I would call three or four times a day and would drive him crazy. Luckily, I had a few other growers, who would help me, too. They all helped me succeed.” — Heaith Baughman headed back home. Fortunately, with the backing of his family, plus financial support from a local dairy family, he was able to start his custom harvesting business. detected his trees were becoming stressed. Advisors determined they were suffering from Alternaria leaf spot, a fungus that appears as a large, brown spot on leaves. If severe, it can lead to nearly complete defoliation by early summer. “I didn’t know what Alternaria was,” said Baughman, adding that he soon learned it could be caused by overwatering. Baughman turned a laser-focus on the problem, which led to the use of sophisticated systems that monitor irrigation. The systems have not only curbed the disease, they have reduced Baughman’s use of water and pumping costs. It’s just part of Baughman’s obsession with seeking out the best practices and best consultants to operate his agribusinesses. “I’m the kind of person who’s bought a lot of ground over the last few years. I’ll set a deal up with a grower and I ask what they want. Some want a 30 day deal. I don’t want to go back to the grower and tell him we can’t do the deal,” said Baughman. Baughman met his future wife Denise at Mission Bank and, after the two were married, moved his business accounts there. Denise no longer works at the bank. Instead, she handles the farming side of HB Ag Inc. and Baughman’s mother handles the custom harvesting side. “My focus is to thrive,” Baughman said. Heith Baughman and his mother Marlene Baughman in their family’s blooming almond orchard just northwest of Bakersfield. “I’m trying to be the best businessman I can; the best family man; and the best father to my two kids.” Maureen Buscher-Dang is a Bakersfield public relations consultant.